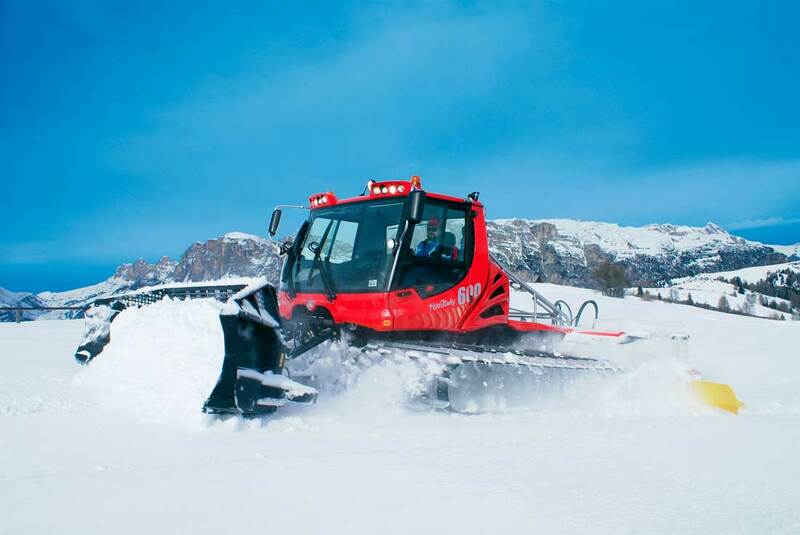 The new PistenBully is unique in terms of ergonomics; drive comfort and design, as well as in terms of technology such as the innovative assistance systems and precision running gear. Countless quality tests and consistent quality management as early as the development phase have made the new PistenBully a vehicle in which all components are exactly intermeshed. In order to guarantee safety in the vehicle, a prototype has to withstand spectacular tests such as the so-called pendulum impact test, which tests the stability of the windscreen, the ROPS test and the cold chamber test. The new PistenBully 600 sets out with a 6-cylinder engine and 400 hp. The generously sized drive pumps with integrated pressure cut-off and servo control and the weight and performance-optimized planetary gearbox ensure optimum efficiency with adequate reserves of torque. The folding transportation platform, introduced with the PB 300 Polar, has been adopted on the PistenBully 600. It is the ideal solution for safely transporting company staff on the platform. Intelligent control and positive diagnosis: the PSX controller is the host computer in the vehicle for central power and energy management. The diesel engine and drive/tiller pumps are directly controlled via CAN signals. The driver’s seat has been completely revamped. It has a greater adjustment range and the winch machines have an integrated harness belt attachment directly onto the swing-action seat frame. This is important for drivers who often sit in the PistenBully for several hours at a stretch. The semicircular steering wheel with built-in multifunctional display is a new development as a result of ergonomic requirements. Large-area glazing extending well down ensures optimum all-round vision. Above all, the side windows allow a very good view of the chains. The generous space provided enhances driving comfort at the workplace. Both drivers, experienced and new ones, can use the intelligent assistance systems entirely according to their own individual requirements and preferences. Self-explanatory controls and a touch-screen make it extremely easy for the driver to operate the system. As there was no joystick available on the market to meet Kässbohrer requirements in terms of ergonomics and driver comfort, a new joystick was developed. Now the driver no longer has to hold the joystick tightly, but rests his hand on it from above. This has allowed more functions to be incorporated in the joystick at the same time as pleasant, fatigue-free handling. The design of the new PistenBully 600 exudes action and energy. All front headlamps and the twin searchlights are integrated in the roof of the driver’s cab, ensuring outstanding long-range and working-area illumination. The two glare-free rear spotlights mounted in the rear wall of the roof provide an optimum view of the tiller and the slope. With the generation change, the PistenBully 600 raises the yardstick yet another notch higher in terms of performance, design, drive dynamics, safety, ergonomics and driver orientation.